Alone and scattered, we can do little. Together, we can accomplish a great deal. The need for unity and collaboration is not only spiritual, but also practical, especially in regard to the Internet. Just imagine that if 10% or 20% of the immense galaxy of Christian websites or blogs posted a link to a common international collaborative media, it would automatically come up on top of search results achieving very high rankings and significantly increasing readership. No other project within the Church has such potential and putting this effort to valuable use is within our reach. The need is very real because we will never get the Christian message heard if we remain isolated and scattered in this era of globalization. But together, we can meet the challenge of the media world and the digital revolution and reach millions of Catholics and non-Christians in every corner of the world. The most important factor that will make us #1 on Google is to have a large number of links pointing towards our central website - Aleteia. 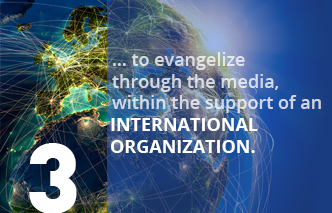 The Foundation for Evangelization through the Media (FEM) was created in Rome in 2010, under the auspices of the Pontifical Council for Social Communications. Its mission is to be a forum for exchange, sharing and discussion between Church leaders, entrepreneurs, the largest movements involved in evangelization, and the media so as to efficiently foster their cooperation and collaboration. FEM's belief is that, without this unity, the contemporary challenges facing the Church in terms of evangelization will not be adequately met. Our mission: to facilitate collaboration in order to boost the presence of the Gospel in the media and the digital world. The FEM's action will be all the more effective and legitimate if it is made up of Catholic institutions that are both significant and active in the area of evangelization and the media. These active members are the ones who will lead the FEM and help define its governance, choices, projects and allocation of funds. The FEM will design and support actionable and far-reaching collaborative projects, efficiently meeting today’s needs. These projects will serve all the media, producers and Catholic productions geared towards working for the New Evangelization. The FEM is establishing fundraising structures in about fifteen different countries to raise enough financial resources to support its activities, both from major donors and the general public. Our key intuition is that, if they remain isolated and on their own, Christians are non-existent in our globalized world. It is only by joining forces that we will be able to launch collaborative projects in proportion to what is at stakeand find the necessary financial support to effectively announce the Gospel through the media. The FEM's main advantage is that more and more people and organizations endorse the idea that unity and collaboration are essential in the field of evangelization, especially where the media is concerned. This is reflected by the continuous expansion of the FEM network, as illustrated by the increased participation at our annual weekend-long meetings every January in Rome, where we work together, share ideas, make and renew friendships. 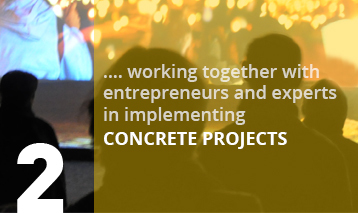 It materializes in the joint development of concrete and appealing projects and by the expansion of our organization in several major countries, with highly involved and motivated teams. 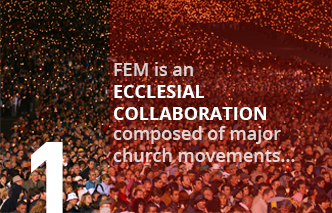 The FEM is an open organization that will grow and expand overtime and will create a wide-ranging collaboration dedicated to the New Evangelization. Transmitting the faith is not as easy as it used to be and this presents a serious problem for the Church, the world and our own personal future.Modern culture is completely indifferent to the Gospel and few young people today know even the basic tenets of their faith. Christianity is however at the origin of our civilization. Universal values such as respect, tolerance, human rights, freedom, love of neighbor, and charitable work derive from the Gospel. The 20th century has shown in bleak counterpoint how dissonant voices, ideologies, and radical positions can lead our societies to the brink of destruction, ushering in a profound sense of disorientation and loss of values, with the dire consequences that we all know only too well. Proclaiming the Gospel is not only a faith issue, it is also of crucial importance for our civilization. What kind of world do we want for our children? Little or no presence of Christian voices and ideas in the media that shape our culture leads to many distortions and errors about the Christian vision of the world and society in matters of faith, Church history, science, etc. Christian beliefs are badly defended and oftentimes not even heard. Major public debates are often blocked in a biased way of thinking, void of contradiction, as they are distorted or closed to alternative viewpoints. Christians are the bearers of the most beautiful message in the world, but unfortunately our wonderful treasures often remain unknown to the general public and the dominating mass media. We must reach people where they are and speak their language. The digital revolution has changed the world we live in and the Church must find new ways to proclaim the Gospel. The FEM's mission is to help meet this challenge.